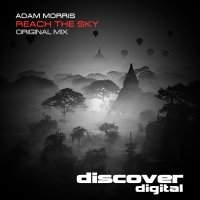 Adam Morris debuts on Discover with the brilliant Reach The Sky. A haunting intro is driven with power by the deep bass and kick and the melodies and key changes mark the tunes territory with intent. The breakdown is an object of sonic beauty with lush chords and a strong melody that builds the tune to perfection. Definitely one for the trance purists. Proper trance executed in style. 'Reach the Sky' is available now from Beatport and iTunes.